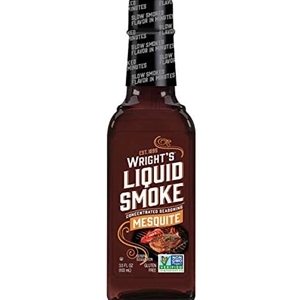 Wright’s Mesquite Flavored Liquid Smoke, the original liquid smoke product, is a concentrate made from the actual smoke of hickory wood. Because it’s concentrated, you can easily vary the amount of smoky flavor in foods, from subtle to full and robust. Liquid Smoke contains no salt, fat or colors- only 2 calories per serving. Wright’s delivers Big barbecue taste to all your favorite foods. Try it when barbecuing meats, poultry or vegetables or use it as a seasoning in marinades, sauces, soups and stews. Ingredients: Water, natural mesquite smoke concentrate.